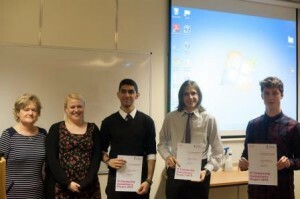 Three groups of Computer Science students presented the results of their IT Consultancy to an invited audience of local charities and businesses at our Jubilee Campus on 25th March. The IT Community Consultants project helps to demonstrate the importance of hands-on, real-life experience for students whilst providing valuable support for charities that often lack in-house IT expertise. Meredita Susanty Alexander Morley and Chris Nicholls worked with Integritas Advocacy to advise them on how to improve data extraction for reporting purposes and how to improve the way they share documents. The final group involved Daniel Allenby, Kaayem Patel and George Tretyakov working with Self Help Nottingham to advise on a new Customer Relationship Management System. These projects are not without their challenges which is to be expected in an environment where students are learning skills that will prepare them for the world of work. If we started with the ‘finished product’ then I guess the project would have less of an impact on the students. We are grateful to our community partners who give their time in support of the project and also to our mentors who help to ensure the work the students do is ultimately of benefit to the organisations. This blog is all about opening up the university to the community at large. Here you can find out how our community partnerships team matches university research, skills and resources to the people and organisations who can benefit.